Okuda’s multicolored geometric structures and patterns are joined with gray bodies and organic forms in artistic pieces that could be categorized as Pop Surrealism with a clear essence of street forms. His murals often raise contradictions about existentialism, the Universe, the infinite, the meaning of life, the false freedom of capitalism, and show a clear conflict between modernity and our roots; ultimately, between man and himself. In his work, multicolored geometric architecture blends with organic shapes, bodies without identity, headless animals, symbols that encourage reflexion … A unique iconographic language. 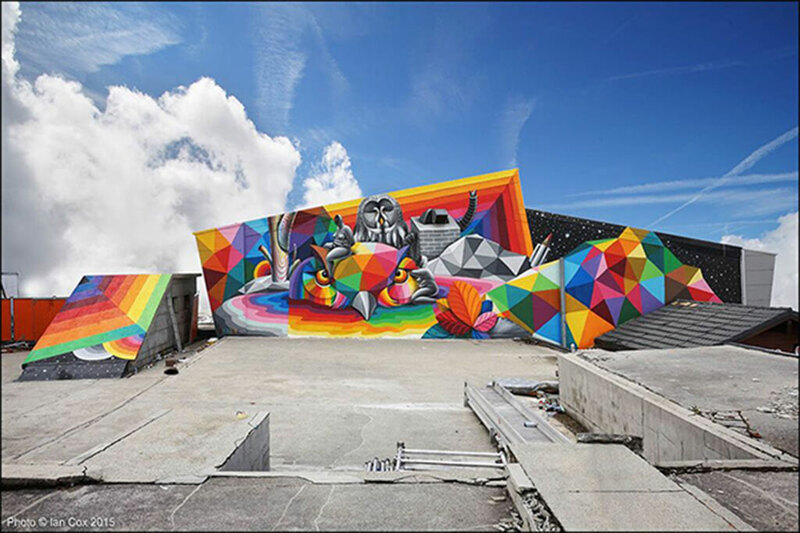 Okuda’s works can be seen in streets and galleries around the world: India, Mali, Mozambique, United States, Japan, Chile, Brazil, Peru, South Africa, Mexico and the European continent among others.